Ma and Fred were shot to death after a four-hour gun battle. Born on 10 August 1907 as Alvin Karpowicz in Montreal, Canada, Alvin Karpis became known as Creepy because of his smile. He began his criminal career aged ten, working with gamblers, bootleggers and pimps. In 1926 he was jailed for ten years at the State Industrial Reformatory in Hutchinson, Kansas, for attempted burglary. He escaped with another convict, Lawrence Devol, and for a year the two carried out a crime wave until Devol was re-arrested. Karpis was arrested when he tried to steal a car and was sent back to the State Industrial Reformatory before being transferred to the Kansas State Penitentiary in Lansing, where he met Fred Barker who had been jailed for burgling a bank. Barker was one of Ma Barker’s notorious bank-robbing, murdering sons — the others were Herman, Lloyd and Arthur or “Doc”. In January 1922 Lloyd was sentenced to 25 years in prison for stealing mail. Doc had murdered a watchman on 16 August 1921 and was sentenced to life imprisonment in February 1922. On 29 August 1927 Herman committed suicide at Wichita, Kansas after being stopped at police roadblock. 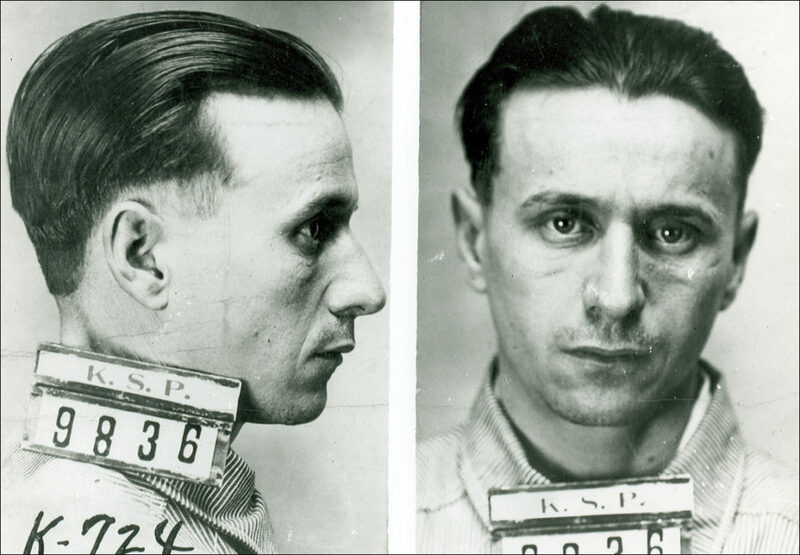 On 30 March 1931 Fred was released and teamed up with Karpis to form the Karpis-Barker Gang. They were ruthless, killing anyone who got in their way. On 10 September 1932 Doc was released from prison and he joined his brother’s gang. On 15 June 1933 they kidnapped wealthy brewer, William Hamm, from outside his home in St Paul, Minnesota. He was ransomed for $100,000 and released unharmed. The success encouraged them to a second kidnapping and at 8.30am on 17 January 1934 they abducted Edward George Bremer, the president of the Commercial State Bank in St Paul, Minnesota, as he went to work. Mr Bremer was released on 7 February after a ransom of $200,000 was paid. Mr Bremer’s father was a friend of president Franklin D. Roosevelt and he encouraged the FBI to step up the prosecution of “public enemies”. Doc was captured on 8 January 1935 and on 13 January 1939 guards killed him during an attempted escape from Alcatraz. On 16 January 1935 Ma and Fred were shot to death after a four-hour gun battle at a cottage at Lake Weir, Florida. Karpis told FBI chief J. Edgar Hoover that he intended to kill him the way the bureau had killed Ma and Fred. Hoover personally arrested Karpis on 1 May 1936. Karpis was sentenced to life imprisonment at Alcatraz in August 1936. In April 1962 he was transferred to McNeil Island Penitentiary in Washington state. Karpis was released on parole in 1969 and deported to Canada. He wrote two books of memoirs and died in Spain on 26 August 1979. When Hoover arrested Karpis none of the agents had handcuffs so the villain had to be restrained by a G-man’s tie.